You are currently browsing the monthly archive for October 2006. Okay, so I have a new obsession in looking at all of my workout stats on sports tracks. I check out the monthly and weekly stats, comparing average pace, distance, number of workouts and so on. Yesterday I was doing a long run which was meant to only be 60mins but I kept going for another 4min to make the km tick over, at least partly because I know it was going to be a close thing to see whether I would beat my PB of weekly kms (I beat it). And with nudge, it automatically tracks all this other cool information which I can also compare, like elevation, calories burned, fastest pace, slowest pace and so on. RAWKS. So I am thinking of doing this run in a couple of weeks. It is only 6.7km but it is straight up hill. It is pretty brutal and I am not really in shape for it, but the course goes almost straight past the weekender and so it is a race that I could easily make a yearly event. I figure I can just set the expectations low and run as much or as little as I want. And to boot, it supports a good cause. Okay, so you know how when you don’t know someone face to face you can kind of get a weird picture of them in your head and your attitude toward them can be kind of distorted because your brain isn’t actually forced to think of them as a real person? Well I find that I am developing a weird mental image of THE COACH ™. I have a great need to impress him and yet I spend most of my time cursing him under my breath (sometimes not so quietly). I have the overwhelming feeling that if I meet him face to face I am going to have a need to apologise for all the rude words I have said about him and his stupid “comfortably difficult” tempo runs. Did you know that a pace that is “comfortably difficult” at the start of a repeat can be “I-think-I-am-going-to-throw-up-now” at the end of a repeat? No weekly weigh ins for another couple of weeks because I have some time off work and we are staying at our weekender. This means that the ordinary running is being complemented by weeding, digging vegetable gardens, bushwalking, lugging mulch and compost and all the good springtime jobs. Also more chances to snack badly so it is pretty much a toss up as to whether this break is likely to be good or naughty. But I do get to draw nice pictures with nudge, like the one above. Was tempted to run right out on the pier and back so that nudge would show more of the sea bed, but by that stage I felt like I was going to puke, and I wanted to get away from the watchful eyes of the people apparently doing some type of group workout program. Maybe next time. So I was trying to convince Hub to get up and barrack for me at SiS2. He ultimately chose to play stupid online computer games until late, and didn’t come to bed until after I was asleep. When I woke up in the morning I found the above note on top of my race gear. 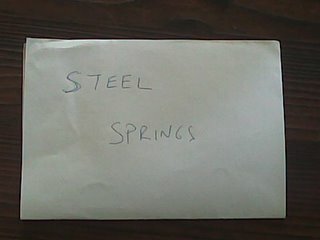 If you can’t read it, it says STEEL SPRINGS, which I thought was pretty cute. Well this time I was much more sensible. Spent the day before getting hydrated (and avoided undoing my good work by drinking alceehol). Of course by the time I got to the start line I had to line up for the loos on three separate occasions. But that was probably a good sign. Met up with a bunch of people from the ausrun forum which was great, if a little intimidating. I was talking last night over dinner about meeting up with people you only know from the internet. And it occurred to me that meeting up with the ausrun people was the best kind of way to meet internet ax murderers. For a hobby that I am participating in totally by myself, I went to a race by myself and was cheered on loudly through the halfway mark and across the line. In the latter case, I was cheered loudly by someone I didn’t recognise (Chris W) because I didn’t even meet him until after I crossed the line!! Anyway, it makes a heap of difference to participating in things like this. So, the facts and figures. The aim was to keep to 7:30 pace for the first 5-6 kms and then bump it up a bit. I managed the first part of the equation pretty well, but didn’t have any “bump” when it got to the last stage of the race. In fact by the end I was well and truly struggling and for some reason kept obsessing about trying to sprint down the hill towards the finish line, convinced that I would trip and do a face plant into the asphalt (I didn’t). So I was pretty happy about this overall, but it is annoying to miss breaking 60mins by such a small margin. That’s the last time I ever walk through a drink station. But I can’t get too upset about a 10min PB, even if my previous PB was pretty soft. I think I have a bit of work ahead of me to PB the next one convincingly. Can someone tell me quickly how to adjust the route of a run that you record in sports tracks through the garmin? I like it but I find it not that intuitive. I am pretty computer literate so just a quick run through of the file/menu structure and basic commands would be fine. A couple of nice people encouraged me in my goal to do the half at the Melbourne Marathon next year. Gosh you are all lovely. Thank you. It’s all a but full on in my head to be thinking about these things, but I remind myself that this time next year I will have been hopefully running regularly for 18 months. I have already been running for less than 6 months and in that time, I have gone from running for 60 seconds at a time, to running for 80mins at a time. None of these goals are set in stone except for the short term ones. But I am a methodical bugger so it helps me to know where I intend to be heading in the longer term. This is pretty motivating for me rather than just heading out to tool around the streets every now and then aimlessly. So, I remember a month or so ago I discovered that I was capable of more than one pace. And it was a revolution. Tonight for the first time I actually deliberately ran to a particular pace. Which made a 4km run a bit easier – because I was breaking it down into components – 1km warm up, 2km at race pace, 1km cool down. The only thing was I kind of miscalculated the race pace bit. So my plan to run it at 7:30 per km kind of fell away when I realised that I was running it at 7min km, the fastest I have run since the beginning of the project (well except for 3 min on the treadmill). I was almost finished congratulating myself when I started to feel like I was gonna puke. So I suspect that coach might tell me off for going too fast. But if I pull up a decent race pace, then I might get off the hook. So yet another reason to do well on Sunday. So I got my first training schedule from my new coach today. Heh. Coach is a guy from the ausrun forum who offered to coach beginner runners for free to develop some experience. So I put my hand up and the new schedule starts today. It will be interesting to see how it goes as I don’t think that the running equation is too complicated for me at the moment – not really up to doing speedwork or complicated sesssions, more about putting in time on my feet. Anyway, it certainly can’t hurt and will be a good bit of accountability to make sure that I am pushing myself appropriately. And plus, if I don’t improve fast enough, I now have someone to blame. Coolness. So, given that I hadn’t been for a run in a week, that in the meantime, I had been the sickest I have been in probably three years with a chest infection and spent most of the week unable to do much more than collapse on the couch and go to sleep, I figured the best way to ease back into it was running up and down hills in 28 degree temperature. I did take it very slow and ran around and about so that if I felt I needed to cut it short I could, but very happy with how I felt. This week has brought home to me how much the Project is improving my general health. I was sick as a dog all week but as soon as I began to shake the infection, I felt like a million bucks. I was amazed. On the tail end of a bad infection, I felt better than I used to feel when I was “healthy”. Oh, and today was the first time I took nudge on a burl around the weekender. The cool thing about the picture that draws is that you can see the beach on the little map thing. How cool is that? Will have to take nudge for an explore around the foreshore a bit in the coming months so that we can take in some more sea views on these pictures. Good luck to all the marathoners and half marathoners for tomorrow!! One of my goals is to join you next year at least for the half (scary – a goal that assumes I will still be running a year from now). Well, I am pretty pleased that I am not running the Melbourne Marathon on Sunday for a couple of reasons. First, I can’t run that far. Secondly, even if I could run that far, I have been laid low for four days with chest cold which has completely knocked the stuffing out of me. So my thoughts turn to SiS2 in 10 days time. Things are not looking good for THE PLAN. Of two scheduled long runs so far I had to cut one short to work around a visit to the vet and have missed one due to chest cold. I have actually managed to do all of my weekly runs and have improved on those, so that’s something anyway. And I have some cooler options for running. So when I look at it like that, in fact the only aspect of THE PLAN which is lacking is the long runs. This weekend is my last chance to get a long run in (provided that the lurgy has left me), and it will be shorter than what I had planned. At the moment I am just feeling really antsy from having not had a run for three days in a row, with no expectation that I will get back out on the track for another couple of days at least. ARRGH. PLUS in the dips section of the supermarket I found some egg salad which tastes really nice on toast with sliced tomato and salt and pepper. I am concerned that I might just eat the whole tub in such a fashion, which is probably not the most on track with regard to eating.